That's a Wrap! 13 Products Were Emptied- What will I buy again and What did I throw away early? Greetings, dear readers! I hope this post finds you well and you have been having a wonderful week! I may not have anything specific planned, but I am looking forward to the weekend! Hopefully you have something fantastic in store for you as well! 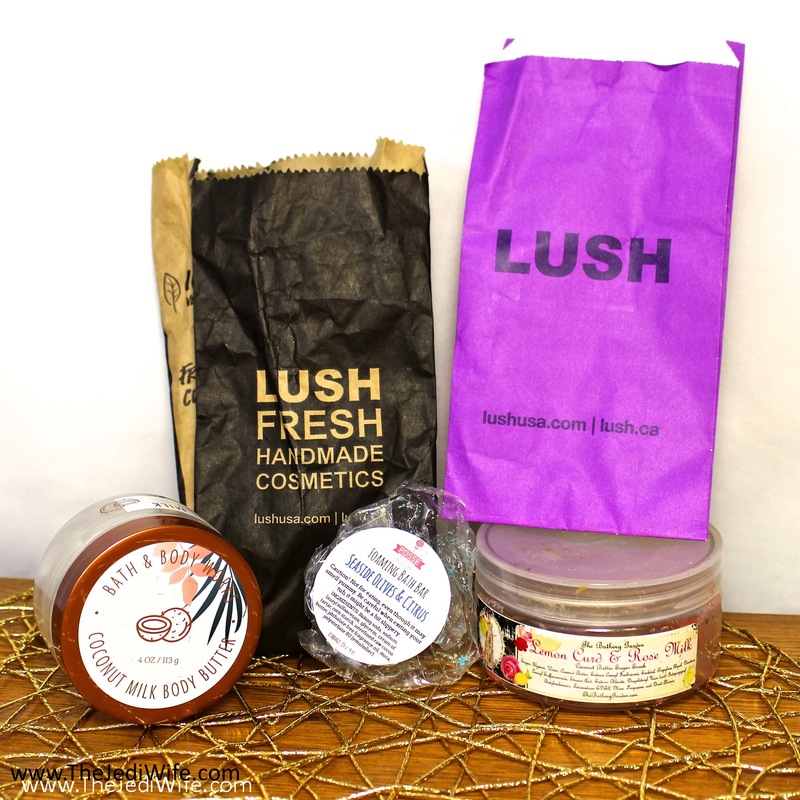 For today's blog post, I have another collection of empty products to share with you. It was becoming overwhelming to plan to go an empties post every month, so I've switched over to filling up my little collection box, and once filled to overflowing on my desk, I'll be getting another post up. What this means is I'll likely have a post up every few months, unless I end up going finishing all the things at once! I'm sure I'm not the only one that doesn't empty anything for a little while and then suddenly BAM! All the things are being emptied at the same time. Rather than continue rambling on and on with my incessant chatter typing, let's jump in and check out what I finish this month. This was something my boys picked up for me for my birthday in March, and it is already empty! I really liked this body butter: it was nicely moisturizing without being too heavy for my skin. It is a little spendier than I like for a body moisturizer at almost $15 a jar, but I'll definitely be keeping an eye out for the next Bath & Body Works sale and pick up more! I was gifted this by one of the members of a birthday group, and I sat on it a little while before opening it. I've not made it a secret on this blog that I detest the fragrance of roses, and I was expecting to not be a fan of this due to the scent. That being said, I am happy admit that I was wrong and I actually enjoyed this! The lemon curd scent toned down the rose just enough so it wasn't overly "rose" for me, and the combination was delightful! This scrub was also great and gently exfoliating my skin! This was actually part of a recent Polish Pickup, and I knew I needed to have one! I really enjoyed the fragrance, and I had plenty of bubbles in my bath from this single bar. I actually ended up purchasing two of these (after giving some time to allow others to pick one up as it was capped) so I am looking forward to that one in the not-too-distant future. Unfortunately, due to the nature of Polish Pickup, I will not be able to buy more, but I am hoping to see more foaming bath bars from Lollipop Posse Lacquer show up in the Polish Pickup! It seems like it was a "bathier" than normal two months, and this includes two different bath bombs by LUSH. I've mentioned both the Avobath and Butterball bath bombs on this blog a few times, and for good reason- they are my favorite LUSH bath bomb scents! You know I'll be picking up more of these babies! Whew, where do I even start with this one! After seeing the ads pop up on Facebook over and over (and over and over) again, I finally decided to bite the bullet and pick this up. Rather than getting a single sample set, I opted to splurge with the larger pack for four facials. This way, I had a greater chance of seeing improvements in my skin. I was really hoping that by the fourth treatment, if not sooner, I would have seen improvements in my skin, particularly in regards to the darker spots on my face. I am sad to report that this did absolutely NOTHING for my skin after all four treatments. The box may contain four treatments that are cheaper than paying for four individual facials at the spa, but $120 is just too rich for my taste with zero results. At least I can say that I tried it and could share my results, or lack thereof, with you readers and hopefully save your money for something better! Olay's Regenerating Serum is once again here on my blog and for good reason- it just works so well with my body chemistry and it makes my skin look good! This product is just further proof that good things don't have to cost a fortune, and I'm already working on another bottle. I'm not sure how well you can tell in this photo, but this product is actually not empty. I know some people are big fans of The Ordinary products, but they just don't seem to work well for my skin. I used this as much as I could, but it made my skin burn often, and it wasn't friendly with my other products. Under my day moisturizers and makeup, it would pill up horribly, and when I used it at night, it would gum up my assorted night creams. After fighting with these issues for some time and leaving this sitting in my cabinet, I decided it was just time to free up that space and use something I actually enjoy. I picked up the travel sized version of this dry shampoo for my recent trips, and I am definitely a fan! The dry shampoo absorbed the oils in my hair quickly, and I didn't have issues with the grey/white cast that dry shampoos generally leave on my hair. The only issue I had with the Perk Up Dry Shampoo is the scent. The fragrance is a little more perfume-like than I prefer, but it isn't a deal breaker for me and won't be preventing me from picking up a full-sized container for use at home! I am guilty of putting off hair cuts a little longer than I should, although in my defense, I've had the hardest time finding a stylist that actually listens to what I am going for and not cutting my hair so much shorter than I want. 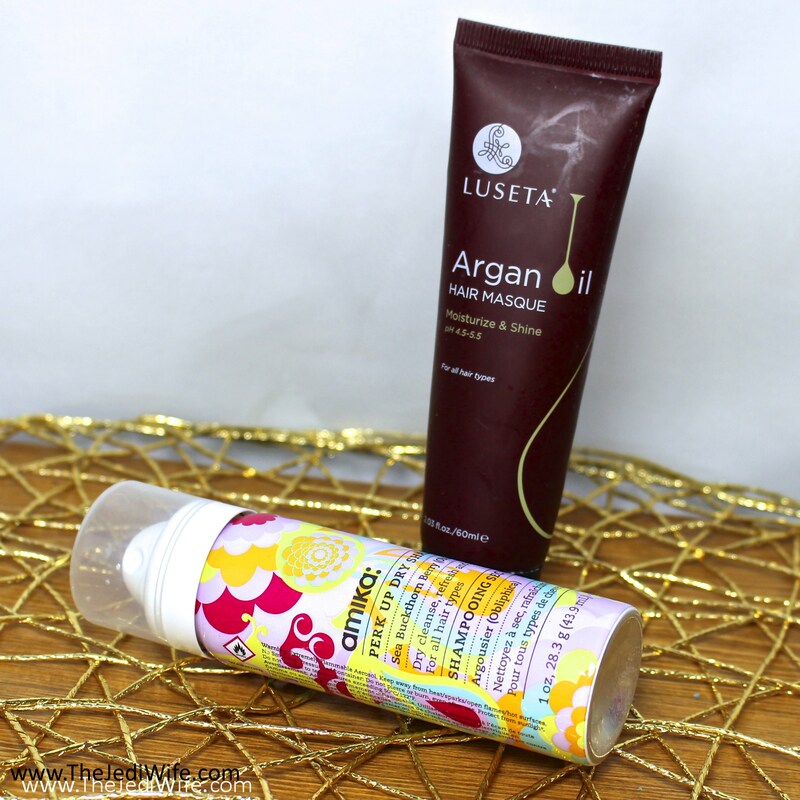 As a result, my hair definitely appreciates the TLC of hair treatments and masks from time to time, and this one by Luseta was fantastic! Obviously, t isn't a magical cure-all for split ends that already exist, but this hair masque helped my hair stay healthy and better able to withstand the occasional blow drying and flat iron treatments. I have a few other hair masks on hand right now that I am trying out, but I am very likely to pick up another one of these from Luseta once those are empty.....or sooner if the others end up being terrible! It's no secret that I have several cuticle oils open at any given point, and they can be found all over my house, in my purse, and at my desk at work. These rollerball cuticle oils by Bohemian Polish kept my cuticles nicely moisturized and looking healthy, and I especially appreciated how quickly the oils were absorbed into my skin. As for the scents, I was expecting Cannabis Flower to smell closer to the actual flower, and I found this fragrance to be a little too earthy and musky for my personal taste. White Chocolate Apple, on the other hand, was more to my taste with a nice strong apple scent. Bohemian Polish has so many scents to choose from that sound incredible, and I intent to pick up more once I can narrow down what I want to try next! 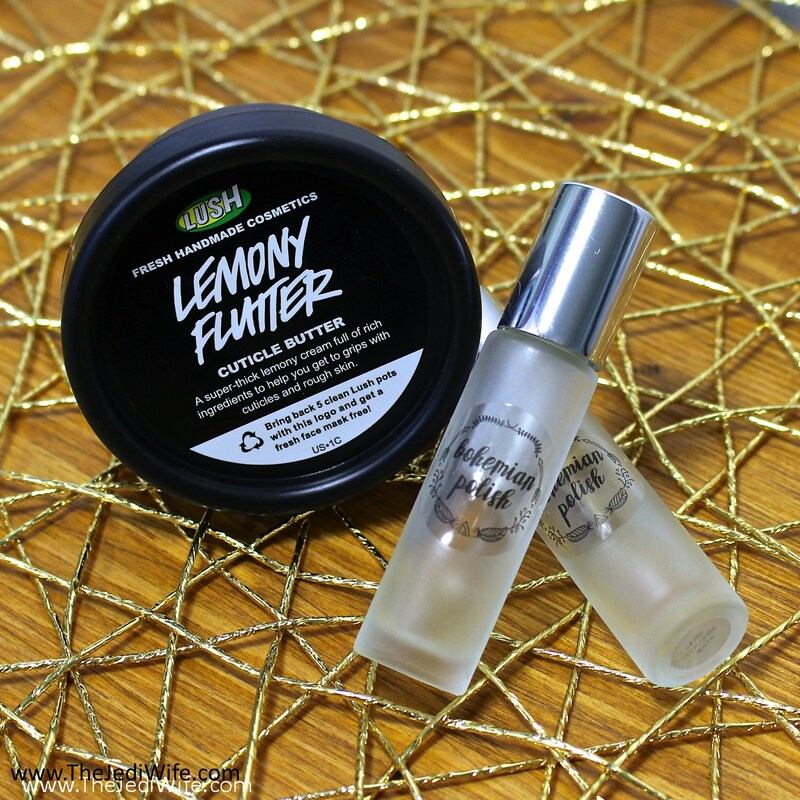 Ah, Lemony Flutter, the holy grail cuticle/dry skin product that I keep going back to again and again. This cuticle butter is so rich, and I like to apply it to my cuticles prior to going to bed. Even just one treatment yields incredible results, and this is why I have been using this item for several years now. A little goes a long way, and the tub lasts for quite some time. That being said, this product is best used fresh and you will want to keep an eye on the expiration date- that will likely happen sooner than you actually finishing up the container depending on how often and where you use it. It is great for use on dry knees and elbows as well! I'm sure it goes without saying that I already have another jar currently in use! This concludes today's That's a Wrap post! Have you tried any of these products? What other products have you used that you've been loving or hating lately? I'd love to hear from you! 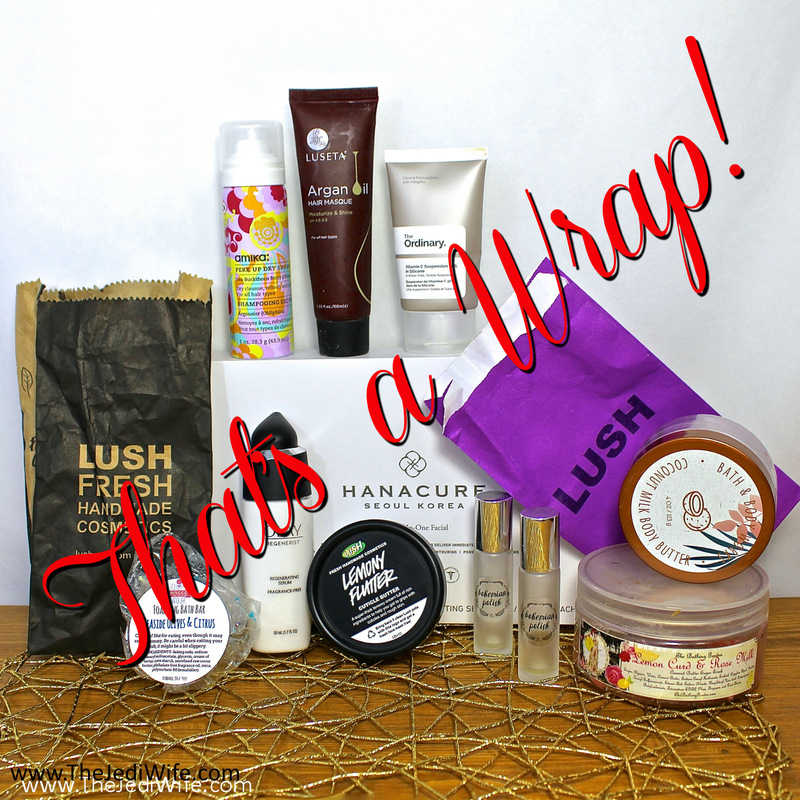 Tags: Beauty, Body products, Hair care, Hand care, Product Empties, Skin care, That's a Wrap! Great empties! Can you teach me how to stop opening new things? I could really use some discipline - especially in the hair & nail care department. I always enjoy your empties posts. I have been using Bohemian Polish Butter Beer Cuticle Oil for years, I honestly don’t know what I would do without it. I love Avowash, the shower gel that smells like avobath! I love anything LUSH! Too bad about The Ordinary serum--maybe 30% was too strong or your skin? Still if it pilled up, that's no good. Great job using things up! I have the Perk Up in my to try bin right now. It's next up for my dry shampoo! And I totally agree with the age of the Lemony Flutter, I bought a tub and didn't use it for 6+ months and it just smelled off. then I purchased on fresh and used it and what a difference! I didn't like that Vitamin C too from TO. It just didn't cut it for me, sub-par quality. I guess I shouldn't complain because it was cheap to begin with. On a positive note, you are good w/ this huge empties post! I can never get through a Lemony Flutter before it expires. I end up putting it everywhere when it's about to go off. Great job emptying all of these! Lemony Flutter is one of my favorite LUSH products. So many things! I love that cuticle butter! First of all 13 is super impressive! I am glad you tried Hanacure bc it's bombarding my Instagram and FB feed right now too and I am totally intrigued, but since you had zero results I won't bother. Also, I might be the minority but I am not a fan of Lemony Flutter. What a great recap. I love the pros and cons of the products. I LOVE the Lemony Flutter and all things LUSH!